Flood covers major parts of the country, while the regime hasn’t done much to manage the damages from last weeks floods. 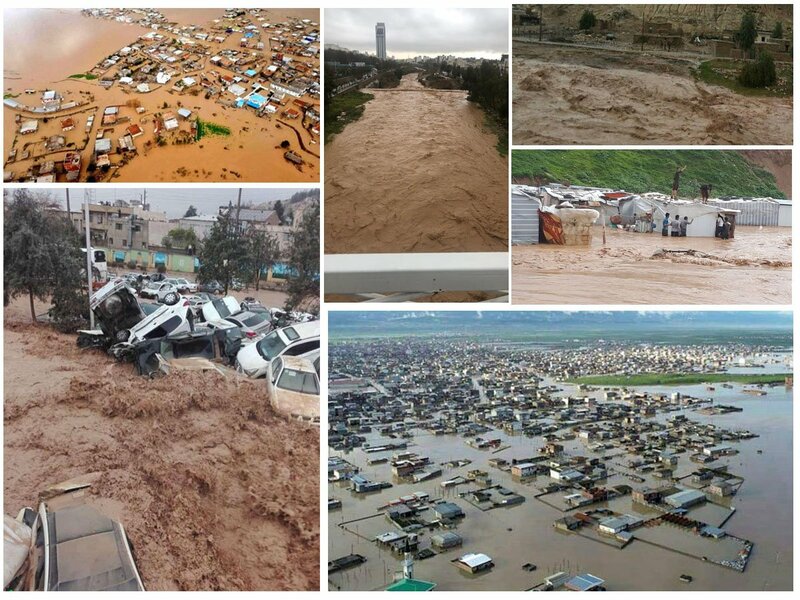 On Sunday, March 31st, Iran was hit by the third major flood in a two-week period. Citizens across the country are still reeling from the first two devastating floods, which affected 30 out of 31 provinces and took at least 150 lives, according to local and eyewitness reports. Survivors of the floods say that authorities have provided little, if any, emergency aid and are not taking adequate steps to confront the current crisis. Catastrophic conditions reported in the cities of Mamulan & Poledokhtar, Lorestan Province, western #Iran. Lorestan Province has seen the worst damage from the most recent flood. Lorestan was badly damaged by previous floods as well, as was the rest of Western Iran. According to local reports, the village of Afarinesh is completely flooded. The village of Rahimabad in Borujerd, Lorestan is surrounded by floodwaters. According to the Lorestan Province Special Representative, a dam near the city of Dorud is overflowing, putting the city in danger. According to the Director of the Lorestan Water Department, three local dams are overflowing. Provincial authorities are declaring emergency conditions and warn of a potential disaster in the city of Kuhdasht. Khorramabad is in the midst of a flood crisis, and a number of its bridges are threatened. Vast destruction left behind by flood. Iranian opposition President @Maryam_Rajavi has declared a national catastrophe. The Khorramrud River has overflowed its banks. Reports indicate that a number of roads in Lorestan are blocked due to flooding and landslides, including Khorramabad-Kuhdasht, Khorramabad-Chegeni, Khorramabad-Poledokhtar, Poledokhtar-Kuhdasht, and Khorramabad-Borujerd roads. Water levels in the Teere River in Dorud are rising. 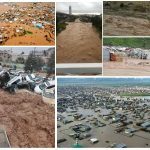 The western province of Kermanshah experienced torrential rain and flooding on Sunday and Monday, with a number of areas reporting damage. Reports indicate that thirty villages in Ravansar, Kermanshah Province, were surrounded by floodwaters as of Monday afternoon. 70-80 percent of the affected villages have been evacuated. Serious flooding has been reported in the city of Kermanshah. The western Iranian city of Hamedan, Hamedan Province, is in danger of major flooding, according to local officials. Northeast Iran was also hit by severe rain and flooding. The town of Aq Qala, Golestan Province has experienced severe flooding, causing numerous road blockages due to landslides and floodwaters. Some areas of Aq Qala were still underwater after the first flood two weeks ago, and residents have still not received assistance from the government in recovery efforts. Locals say that officials have failed to provide emergency aid and to take action to mitigate further damage. Flooding has also occurred in southwestern Iran. A river in Andimeshk, Khuzestan Province, has overflowed its banks and poses a direct threat to the lives and safety of local residents. Reports indicate that the city of Ahvaz is in danger due to rising floodwaters. In central Iran, the roads from the city of Arak to Tehran and Farahan are blocked by floodwaters. Torrential rain and flooding is forecast for Tuesday and Wednesday in the provinces of Khuzestan and Lorestan. Mrs. Maryam Rajavi, President-elect of the National Council of the Resistance of Iran (NCRI), issued a statement last week expressing her condolences to those affected by the floods and their families and urging the people of Iran, especially the youth and the MEK’s Resistance Units, to “rush to the aid” of flood victims. The regime has failed to provide badly needed emergency aid to people suffering in Iran. Assistance is coming from their fellow citizens.